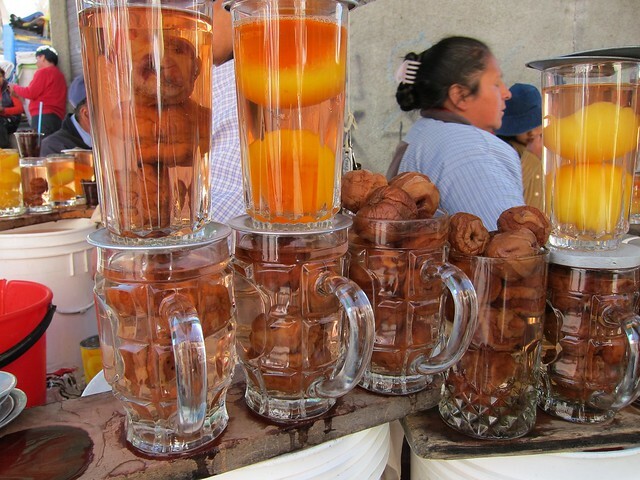 We're always on the lookout for new street food, especially if the locals are eating it, so after seeing stands in La Paz selling glasses of amber liquid with a strange round object at the bottom, we eventually worked up our courage to ask what it was and try a glass. Despite our best guesses for what the strange object was: bread, chocolate balls..., it turns out that they're merely dried peaches which are then used to flavor the sweet peach juice. When our turn came up, we tried the drink timidly, then quickly finished it. It was tasty: sweet and fresh, but nothing lifechanging. More than the taste, the best part of the drink was taking part in an experience we saw all over Bolivia, and South America in general: instead of putting takeout short order food in plastic or styrofoam containers and exchanging as few words as possible with the cook, as might be common in the US, street food is a social affair here. The juice was given to us in the type of glass you'd find in any of our cupboards, and the patrons just stand around for a few minutes sipping it and chatting with each other and the women running the stand. We've also seen full meals served this way: rice, some stewed meat, and perhaps some veggies served out of huge pots onto real plates and eaten family style at stools at a picnic table under a tent. Bonus: the untreated water didn't even make us sick!